Each prospective Cobra* Replica buyer has many questions about his/her potential dream car. We have undertaken here to try to effectively anticipate, and answer, some of the most frequently asked questions. We hope you find the reading of these rewarding, and may move on to more detailed questions when you come to visit us. Q) How long has Unique Motorcars been in business? 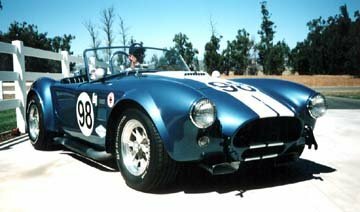 A) Our company was founded in Phoenix, AZ in 1977, and began building Cobras* Replicas in late 1977 (see "About Us"). Q) How do your cars differ from your competitors? A) When you compare cars, like in all things, you first must be sure you are comparing "apples to apples". Be sure you compare only those few other makes that may actually be comparable. 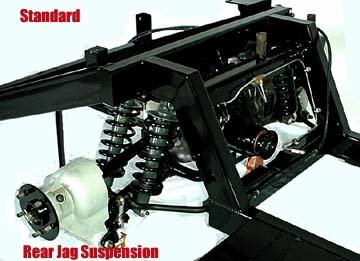 With our hand laid fiberglass body, fully independent suspension, quality of accessory items, fit & finish, and our excellent reputation, it tends to narrow the competition considerably. We build quality, not quantity. Our replicas are built with the highest quality components available.. This gives our customers the most dependable Cobra* Replicas on the market today. After years of use, our cars hold some of the highest resale values in the industry. Q) What type of suspension do you use and how strong is it? A) We use a Jaguar independent rear suspension. It is a Salisbury unit with Dana 44 gears. It is a very strong suspension with excellent handling characteristics, and a surprisingly smooth ride. The front suspension is our own design, using tubular "A" arms, Carrera adjustable coilover springs/shocks, and Wilwood disk brakes. It utilizes Mustang spindles, anti-sway bar, and original style rack & pinion steering assembly. Remember, the way your car rides and handles is a big part of the resale value! Q) Is your frame round or square tube, and which do you believe is stronger? A) Our frame is made with rectangular tubing. The main rails 2"x4"/.120 wall thickness. This makes a very strong frame, with virtually NO chassis flexing encountered. This is definitely stronger than round tube. Main frame rails are 2"x4" rectangular tube. Outer rails (body support) are 2"x2" rectangular tube w/bracing. Additional framing is added under the body across the front of the cowling. Door posts and door hinges (steel beams in-between) fasten to this sub-frame component for a very rigid, safe, chassis. Our cars are built to last for a very long time, and give you the maximum driving experience with your dream car, Cobra* Replica. Q) What type of accessory items and hardware do you use? A) Unique uses only the correct original type of hardware and accessories on their cars. We would rather pay more to get an authentic part than compromise quality or reliability. For example, our kit comes standard with a leather interior while most others offer leather as an expensive option. Q) Do you offer kits in different stages of completion? A) Yes, we offer kits in all stages from basic to deluxe pallet kits. Our most popular package is the "Deluxe Pallet Kit" which is an assembled kit less engine, transmission, wheels, tires, paint, and some minor accessories. From the basic kit to our most complete kit all welding is done and no fiberglass is required. The doors, hood, and trunk are all hinged and fitted, and the body is fitted to the chassis. This makes the kit easy to assemble by our customer. Q) Can a tall person fit in your car? A) Yes, we have longer foot boxes than the original car. We also were the first to use a dropped floor in our cars. We also offer a cut-out dash for more knee room. Additional things, such as, smaller steering wheels, raised columns and different seat positions give even more room for the large driver. We have several customers 6' 4", and two customers 7' tall. They fit their cars quite easily. 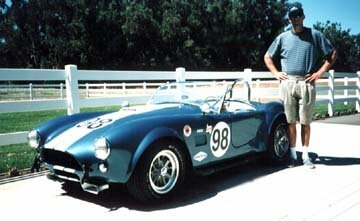 Here's Bob Evans, 7' 2" next to, and then, in his beautiful 289 Model Cobra* Replica. Q) What engine options do you offer? A) We set up our 427 kit up for any small or large block Ford motor. Our 289 kit can accommodate most all small block engines. Transmission choices run from the C4 or C6 automatic, to the venerable toploader 4 speed or Tremec 5 speed. 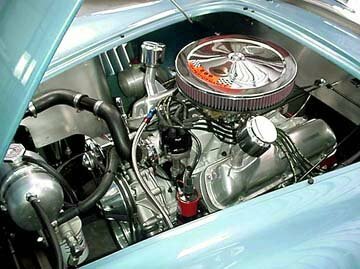 Feel free to call us and ask about any engine/transmission package ideas you may be considering for your dream car. Below, you see a small block on the left, and a big block on the right. The left picture is our 289 Model car with a properly dressed small block.. The picture to your right is a nicely dressed FE big block in a customers car. Q) How much does the car weigh? A) Our big block car weighs between 2450 and 2600 lbs. The small block cars weigh between 2200 and 2450 lbs. Q) How does your car ride? 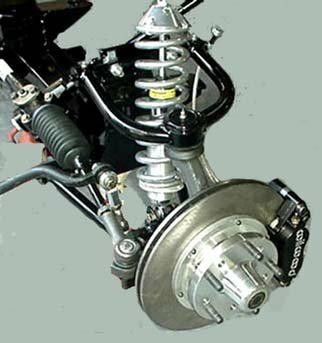 A) You will find our cars with fully independent custom suspension (utilizing proper spring/shock rates) ride much smoother than any live axle car, and smoother than many independent suspended cars. We often hear from our customers that there Cobra* Replica rides as good as, or sometimes better than their daily driver car. Q) How about resale of a Unique replica? A) Our cars have always had a very high resale value. It is quite common for our customers to sell their cars for a profit. We have several repeat customers that can attest to that. If you are interested in a used Unique Motorcars Replica you may have to look for awhile as most customers hold onto their cars a long time. Q) Can you provide me with references? A) Yes, we can. Most of our customers are happy to talk to you and show off their cars. Beware of a manufacture that will not give you references! Q) Can you supply the engine and transmission for my car? A) Yes we can. We have engine builders we recommend or you can supply your own engine and we will install it for you, if you wish. Q) Do you build turnkey cars? A) Yes, we offer completed cars and always have demos available at shows that show our workmanship. Q) What about a deposit, how much do you require? A) Basic kits require a $3,000 deposit with delivery times as little as 6 weeks. Deluxe Kits are a $7,500 deposit with a draw based on total kit price midway through completion and the balance due prior to completion. Delivery time for a Deluxe Kit is about 12 to 15 weeks. Q) How about a warranty? A) Yes, we provide a 12 month warranty on the parts we manufacture, all other parts carry their own respective manufactures warranty. If you have other questions, either send us e-mail, call us on the telephone, or come by and chat with us anytime you can. We really like to get to know our customers, and do not mind spending some time showing you around our factory, in-fact, we are quite proud of it! By all means, call first for an appointment for a visit, but, DO visit us, we will both be glad you did!